Q. When was the last time you felt truly fulfilled in your job? A. With over 350 agencies across Ontario, a career in Developmental Services offers you the opportunity to make a difference in the lives of people with developmental disabilities. Q. What exactly is a developmental disability? A. A developmental disability is one that permanently limits a person’s ability to learn. It’s a disability that a person is born with or one that begins before he or she turns 18. It can be mild or severe. People with a developmental disability may learn, understand or remember things at a slower pace than others. This can affect their personal care, language skills and their ability to live without support. With support from someone like you, a person with a developmental disability can participate fully in their communities. They can be athletes, artists, advocates, workers, neighbours and friends. 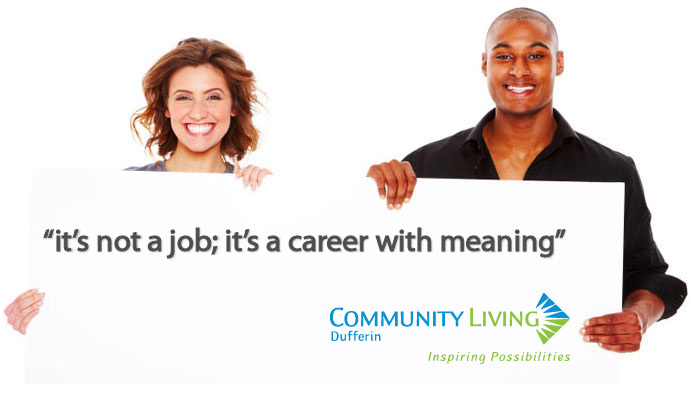 When you choose a career in Developmental Services, you can help people experience the joy of being valued and respected members of their community. You can help them pursue their dreams and lead full lives with endless possibilities. And in doing so, you can realize and experience a meaningful, fulfilling work life. Developmental Service agencies need people who want to make a difference; people who see the possibilities in others and can support them in reaching their full potential. They need people who want to advocate for others and make a positive contribution to their community. Supporting people with developmental disabilities can include providing direct support as well as serving in administrative and management positions.